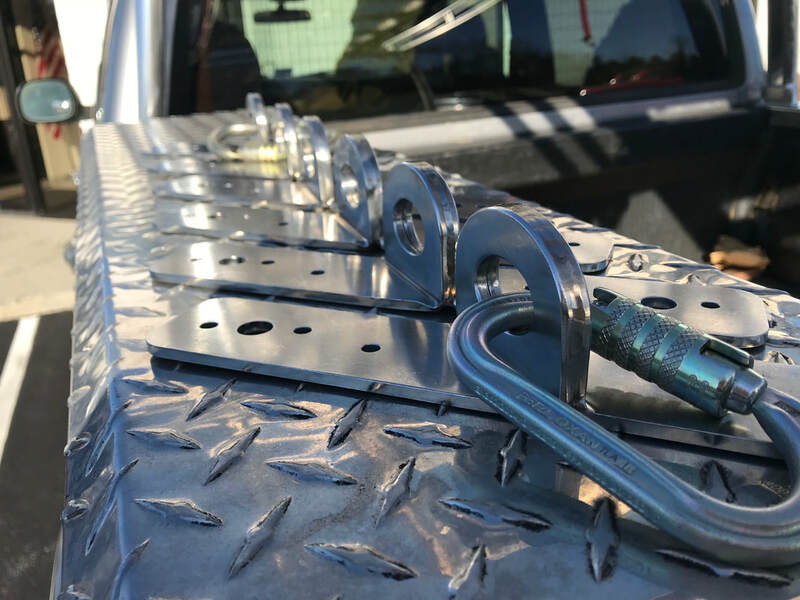 Our patent-pending V-Series anchors are the strongest, simplest, most durable anchors you will ever use. v-1 temporary reusable anchor - order here. Made in America, heavy duty stainless steel TIG welded removable anchor. 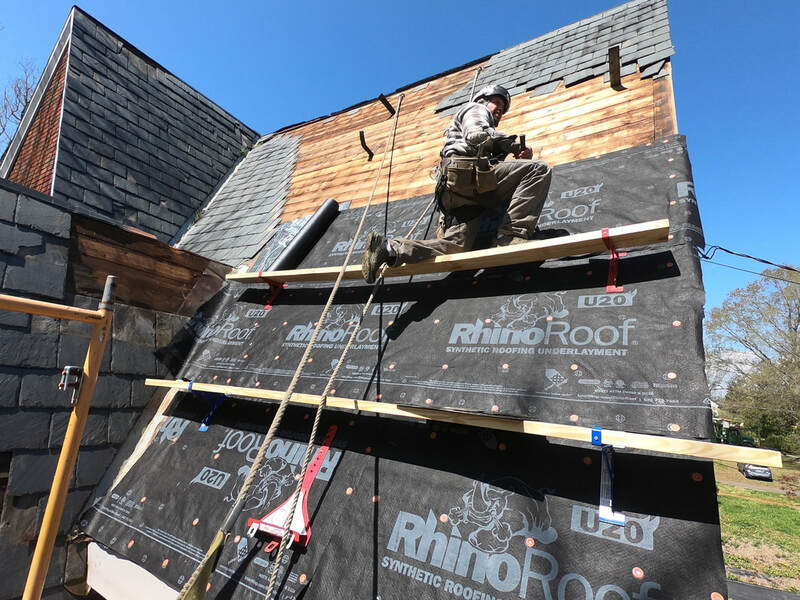 Meets OSHA 1910 and 1926 requirements when installed through roof sheathing into a roof rafter using (6) TimberLOK 4" hex-drive structural wood screws. Comes with 6 heavy duty fasteners and a hex drive bit. ​Recommended for best use with Petzl's triact-locking Vulcan or Oxan carabiners. Each component below is an important part of the V-1 access system. Petzl gear - such as descenders and harnesses with sternal fall arrest attachment points are extremely complimentary to the system as well. The RAY 12 mm static rope with sewn termination is designed for use with an ASAP (international version) or ASAP LOCK mobile fall arrester. The standard diameter ensures a good grip for easier handling. It has low stretch when put under tension, allowing it to meet the requirements of U.S. fall protection standards. The sewn termination with protective sheath helps keep the connector in position and facilitates handling. 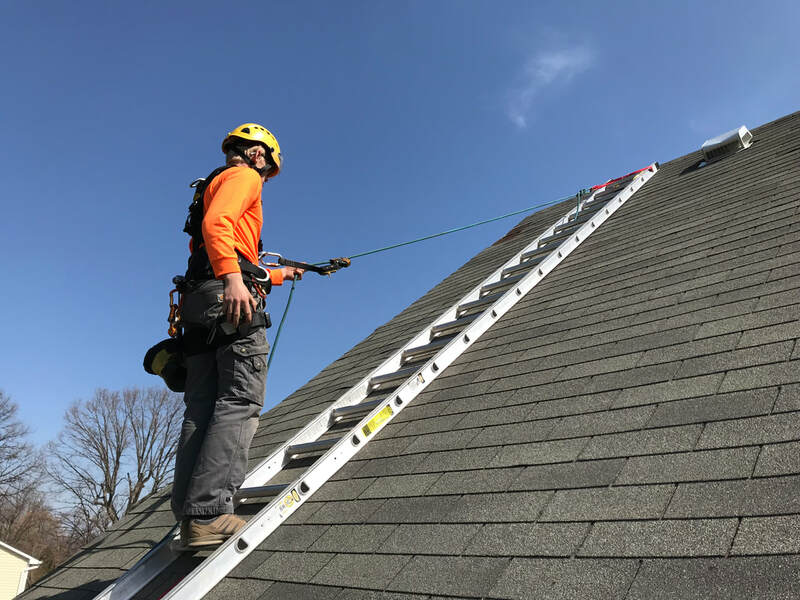 Rope available in five lengths and the 50' length seems to be most popular for roofers. My crew is required to tie a knot in the rope that will prevent them from ever falling over the edge of the roof. Meets ANSI Z359.15 criteria when used with a RAY 12mm rope with a sewn termination. System includes Petzl's: ASAP LOCK, load limiting energy 'SORBER INTERNATIONAL (20 or 40 cm)and BM'D triact locking carabiner with a CAPTIV positioning bar. ​The ASAP LOCK mobile fall arrester is designed to facilitate handling during rope ascents. In normal use, the device moves freely along the rope without any manual intervention and follows the user in all his/her movements. In case of shock or sudden movement, the fall arrester locks on the rope and stops the user. The integrated locking function allows the user to immobilize the device in order to reduce the length of a fall. The connection arm makes the system drop-resistant when passing intermediate anchors. The ASAP LOCK is used with an energy absorber to work at a distance from the rope. NOTE: Use of sternal fall arrest rings requires a maximum freefall distance of 2 feet to meet OSHA's standards. Tight ropes and minimal slack are necessary in any safe system. Convenient size box of (120) V-1 approved fasteners needed to complete an OSHA compliant installation. One hex drive included in each box. Use new fasteners for each installation of the V-1 to meet OSHA's load requirements. Fasteners are TimberLOK 4" hex-drive structural wood screws by FastenMaster.​ Keep a box in every work truck. Recommended to be installed with a cordless impact driver. What becomes your fall protection anchor once the ridge anchors have been removed? 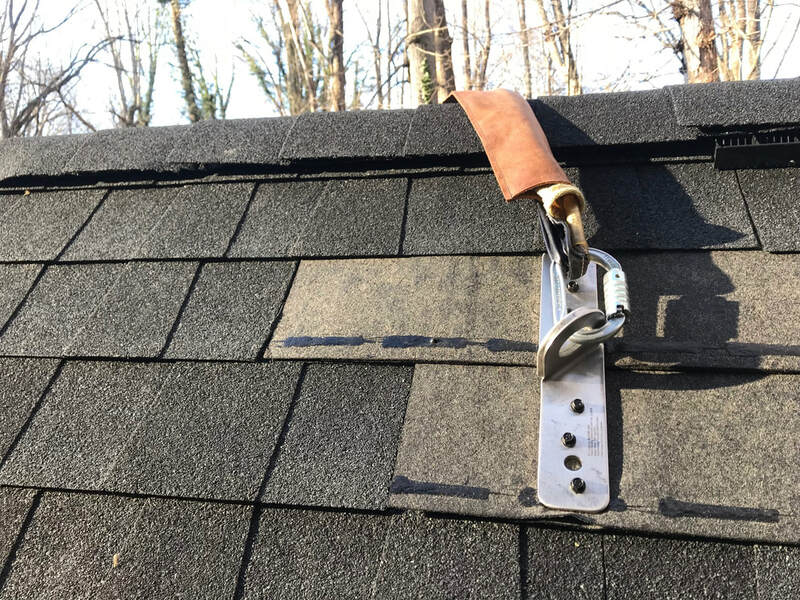 How does the roofer safely cut the ridge vent opening and install the ridge vent and cap shingles? The ridge anchors were in the way and have usually been removed. 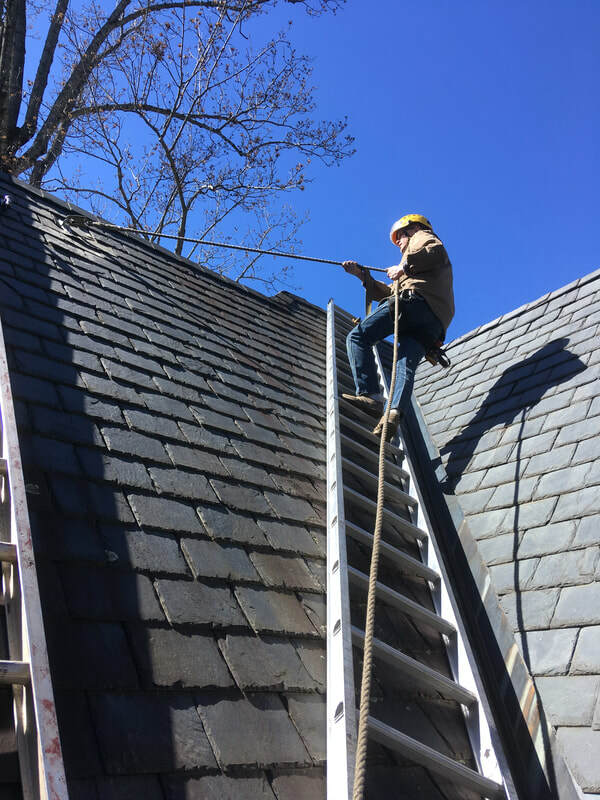 Without proper planning, the roofer is exposed to potential falls during this time consuming final task. Why use ridge anchors . . . at all? Scroll down to compare the Pros and Cons. With the right gear, you can go anywhere. Allows worker to work on either side of roof. In the way during asphalt shingle tear offs. In the way during completion of the ridge. Cannot be installed over ridge vents. Not compatible with slate roof work. Not compatible with new metal roof installations. Not designed for hip roof installation. Generally NOT designed to be used in a flat or folded "in half" position. Requires 12 - 32 fasteners per installation. Primitive welds and usually made overseas. Metal is thin, deforms easily and moving parts wear out over time. Allows worker to have fall protection in many directions. Can provide fall protection from start to completion of job. Fasteners have a smooth shank which helps user locate the rafter. Made in the USA out of 7 gauge stainless steel. TIG welded by expert, certified welders. 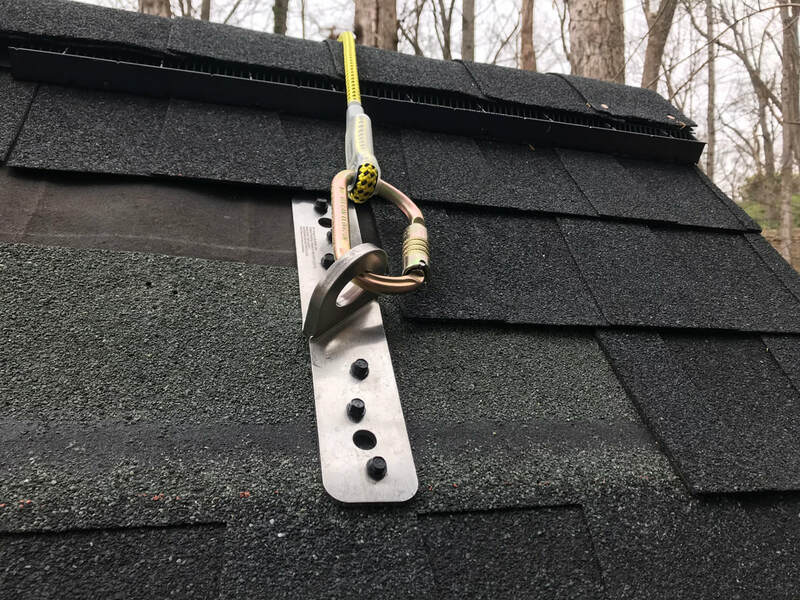 Installs with 6 fasteners through the sheathing into a roof rafter. 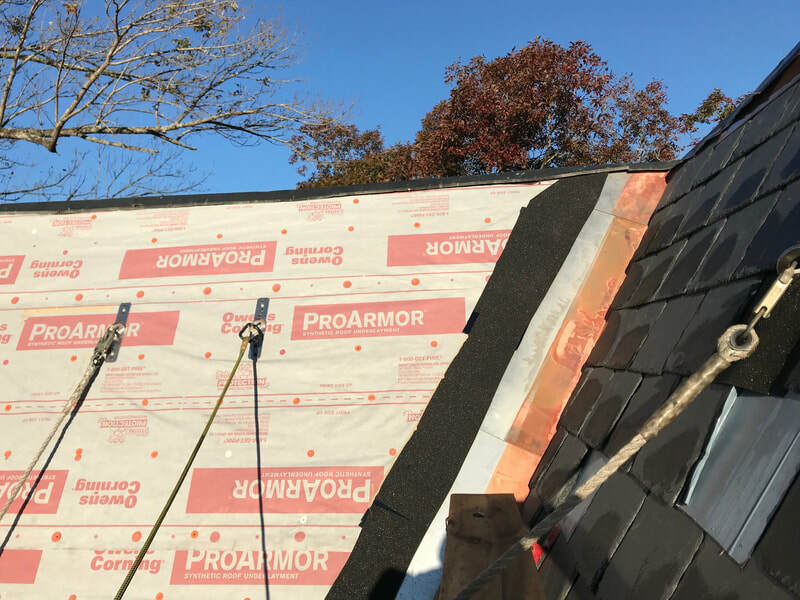 During repair work, only 2 shingles are affected by installation. Compatible with many roof types. 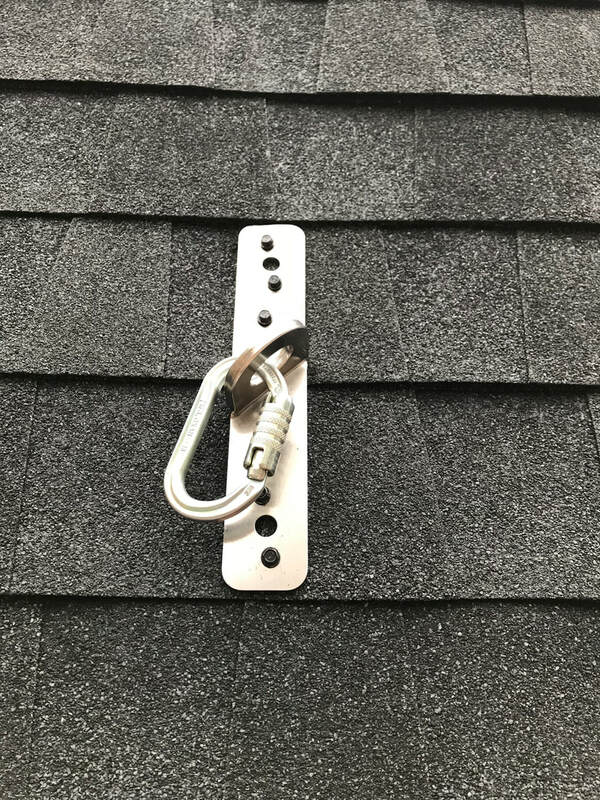 Can be installed at any location on a roof in a suitable rafter. Hole centers are designed to help secure scaffolding to masonry walls. Can be laser engraved for Company ownership. Long fasteners may drain cordless drill/impact driver battery charge more quickly. User attention required to avoid improperly positioning a carabiner or connector. 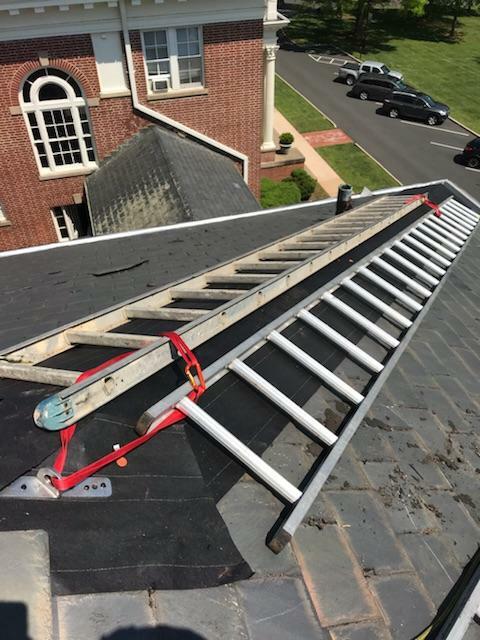 Instead of ridge anchors, we recommend strategic placement of V-5 permanent anchors. 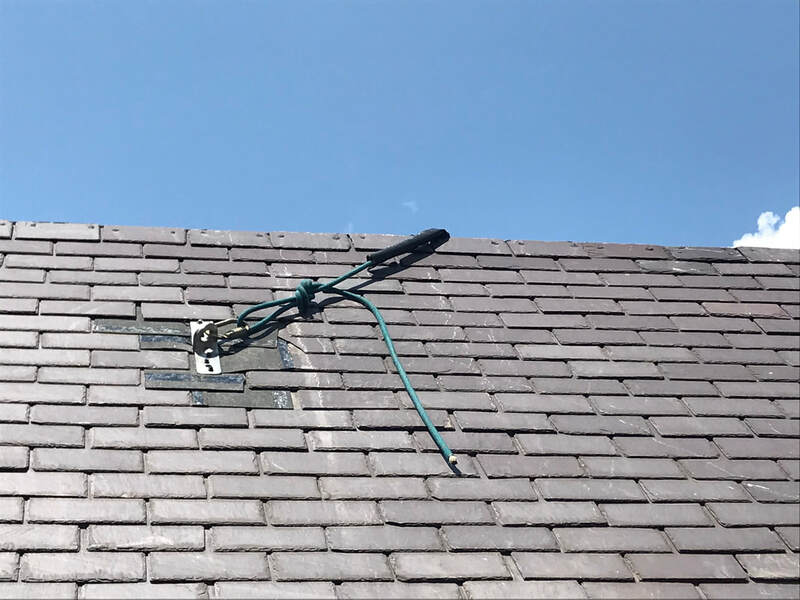 Another method is to use V-1 anchors on each roof surface during the roof tear off and installation. Generally, we recommend locating anchors 18"-24" below the ridge every 16' and 4' off the rakes. 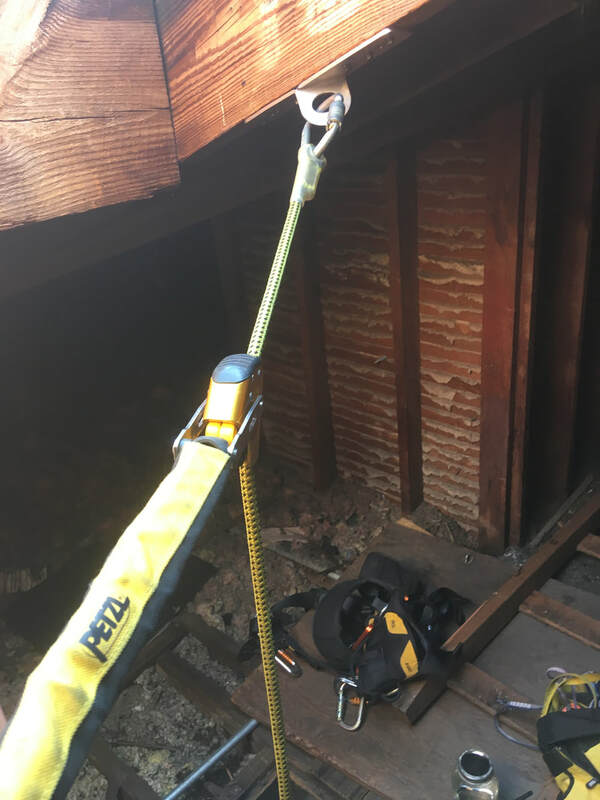 If the rake is lengthy and a large potential swing exists, we recommend using a vertical lifeline parallel to the rake (Petzl Ray rope and ASAP mobile fall arrestor)​ with a V-1 positioned at the top and bottom. 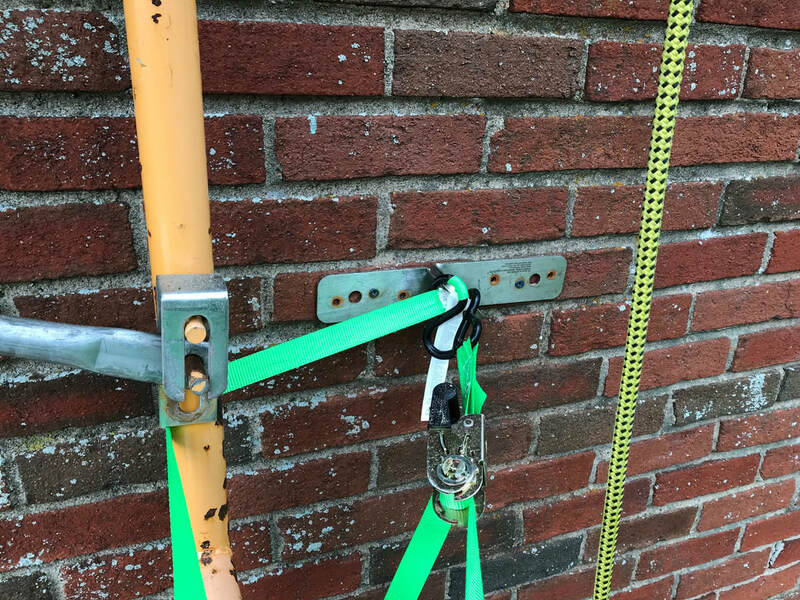 The V-1 is also an ideal anchor for securing scaffolding to the side of a masonry or wood sided building. Guys, ties, and braces shall be installed according to the scaffold manufacturer's recommendations or at the closest horizontal member to the 4:1 height and be repeated vertically at locations of horizontal members every 20 feet (6.1 m) or less thereafter for scaffolds 3 feet (0.91 m) wide or less, and every 26 feet (7.9 m) or less thereafter for scaffolds greater than 3 feet (0.91 m) wide. The top guy, tie or brace of completed scaffolds shall be placed no further than the 4:1 height from the top. 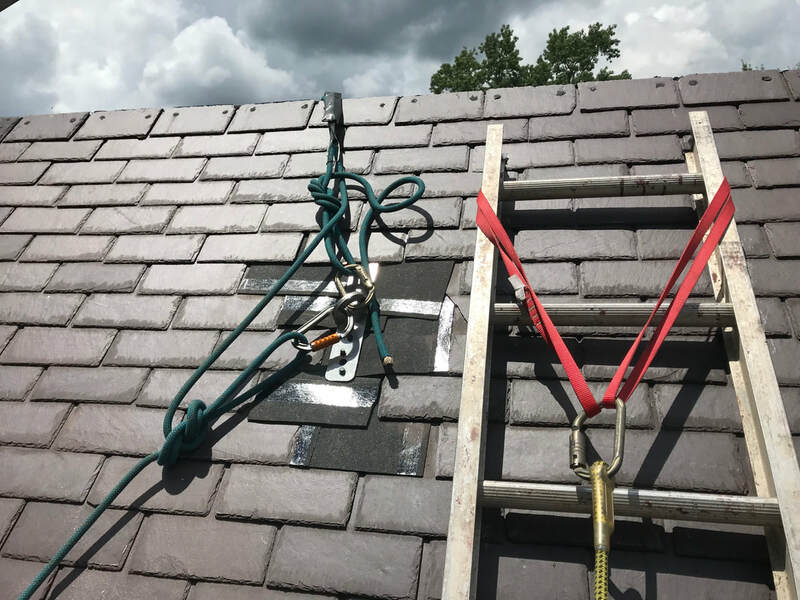 Such guys, ties and braces shall be installed at each end of the scaffold and at horizontal intervals not to exceed 30 feet (9.1 m) (measured from one end [not both] towards the other). Note: Working at heights is hazardous. Always inspect your anchors, carabiners and ropes for damage before each use. It is critical to protect the rope from sharp edges and potential cuts. 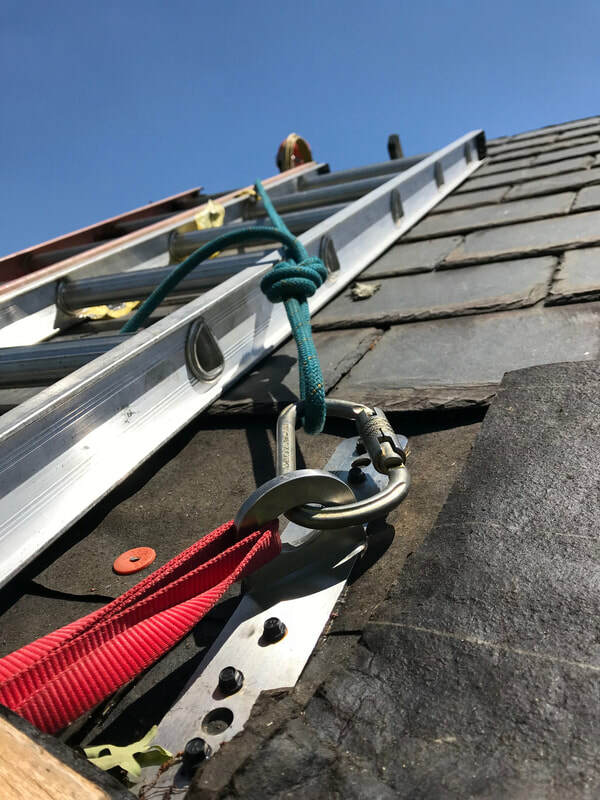 We prefer using an anchor on each roof surface, however, if we do work over the ridge or around a corner we recommend using a "buffer" to protect the rope from potential cuts. The V-1 is designed to be used with Petzl's triact-locking VULCAN or OXAN carabiners. Use of other connectors is discouraged and should only be done with more caution. Inattentive use of any connector may create a "binding" situation that may improperly load the connector's gate, leading to failure of the connector and a hazardous or deadly situation. 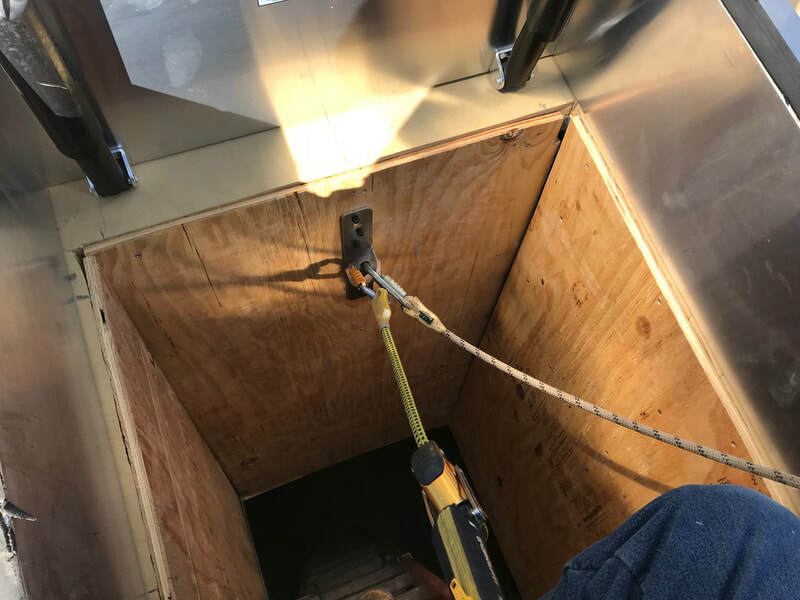 Always keep your rope tight and connector oriented in a position that will load it along its major axis.